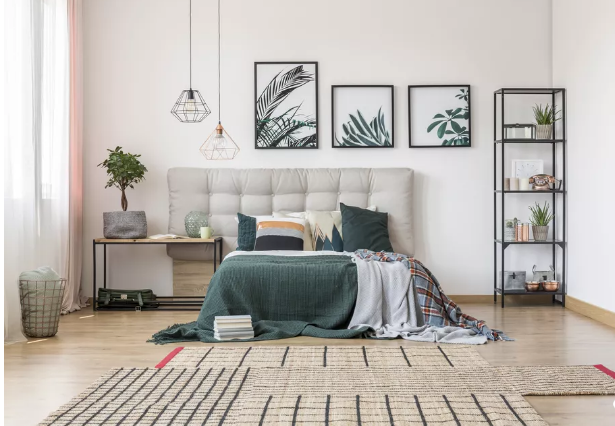 Decorating a Bedroom with a Botanical Theme-Botany is the study of all things plant-related, from flowers to leaves to branches to tree trunks. So a botanically inspired bedroom is one in which plants – in any form – play a large part in the decorating scheme. Fresh, vibrant, growing and alive, plants have a naturally soothing quality that makes them highly suited to a starring role in the bedroom. So whether you choose the real thing or prefer décor with botanical motifs, it’s time to harness the power of the plant in your interior decorating. To help inspire you, here are nine bedrooms that perfectly rock the botanical theme. Pressed Leaf Artwork-Looking for a way to not only decorate your bedroom, but also to preserve that perfect fall leaf you found on a walk, the most gorgeous flowers from your spring garden, or even a treasured bouquet given to you by a significant other? Then give the old-fashioned hobby of pressing leaves or flowers a try, and create a botanical gallery wall, as in this room from blog Lemonade Pockets. To start, gather up your flowers or leaves, choosing specimens that are fairly flat to begin with, and without tears or imperfections. They should be completely dry, as well. Lay out a layer of newspaper or tissue paper, and then arrange your leaves or flowers across the paper, leaving space in between them. If drying a bouquet, you’ll need to separate the flowers into a single layer. Cover the botanicals with another few sheets of paper. Set a heavy stack of books on top of your botanicals, and leave them to dry for a few days. Spray the leaves or flowers with a clear acrylic sealer, easily found at any crafts shop. This will keep the botanicals from fading or crumbling over time. Arrange your specimens on off-white scrapbooking paper, using adhesive spray to hold them in place. Frame the arrangement with a glass-front picture frame. Hang and enjoy! Plant as Headboard-Who said you had to use a traditional headboard at the top of your bed? Instead, why not give a large potted plant the position of honor, as in this room from Emma Reddington of The Marion House Book? Look for a large plant with a naturally spreading growth pattern and big leaves, like the fiddle leaf fig shown here, or a palm, Swiss cheese plant, or umbrella plant. Be sure it’s easy to reach the plant for watering, however, so your living headboard continues to thrive. So fresh and pretty. Botanical Accent Wall-Accent walls have become a fairly standard way to add a punch of “Wow!” to a room, so if you are looking to go botanical, consider a plant-inspired accent wall at the head of your bed. The easiest way to achieve the look is with a bold wallpaper, like the glorious riot of “framed” birds, butterflies and leaves from Sanderson shown here (yes, that’s wallpaper, not a gallery wall.) You’ll find nearly endless choices, so whether you want flowers, leaves, trees, or an entire woodland scene, you can have it. What a great way to add life to your bedroom. Botanical Bedding -Maybe you can’t sleep underneath a bed of flowers, but you can certainly sleep under floral bedding. Since your choice of comforter or duvet cover sets the pace for your entire bedroom, if you crave the botanical look, that’s where to start. A gorgeous floral duvet cover; comforter patterned in a design of leaves, branches or ferns; or a quilt with a tree pattern are all good options. If you prefer to keep your bed topper a simple solid, then use botanical motif throw pillows and sheets to highlight the look. This lovely bedroom is from Martha’s Vineyard Interior Design.